Currently, there are no known photographs of the early submarine pioneers that manned the Hunley. In order to put a face on their contribution to maritime history, the Hunley Project created visual reconstructions of the crew in preparation for their burial in 2004. Each skull was cast and the cast served as the foundation that defined the shape of the face. Forensic information was also incorporated about each crewmember’s age, gender, and injuries, such as a healed fracture of the nose. Next, clay was overlaid onto the cast of the skull to reflect the overall shape of the face, including the forehead, prominence of the brow ridges, profile and outline of the jaw. When the information was not available from surviving military records, hair, eye and skin color were left to the interpretation of the forensic artist. For a few Hunley crewmembers, hair color was able to be determined from military records. 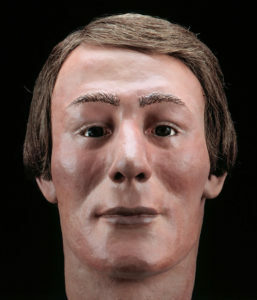 Facial reconstruction of George Dixon. The different stages of reconstruction. Twenty-one depth markers were attached to each skull cast at specific locations as a means of estimating average facial thicknesses. Clay was overlaid onto the cast of the skull to reflect the overall shape of the face, including the forehead, profile and outline of the jaw. The forensic artist added lines such as crow’s feet and smile creases to reflect the crewmember’s age range as determined by the forensic analysis. The width of the mouth was approximated by measuring the distance between the canine teeth. The thickness of the lips was estimated by measuring the distance between the upper and lower central incisors at the location where the tooth meets the gum. The shape of the nasal spine helped determine the configuration of the lower portion of the nose. For example, an upturned nasal spine suggests a pug nose and a down-turned spine suggests a hook nose. Hair, eye and skin color were left to the interpretation of the forensic artist. For a few of the Hunley crewmembers, hair color was able to be accurately determined by preserved hair recovered from the submarine. 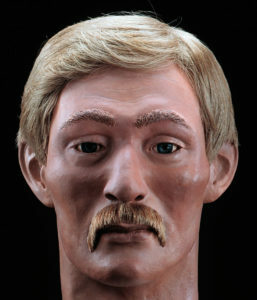 Facial reconstruction of Arnold Becker.